This blog is not called CancunScoop (and never will be!) 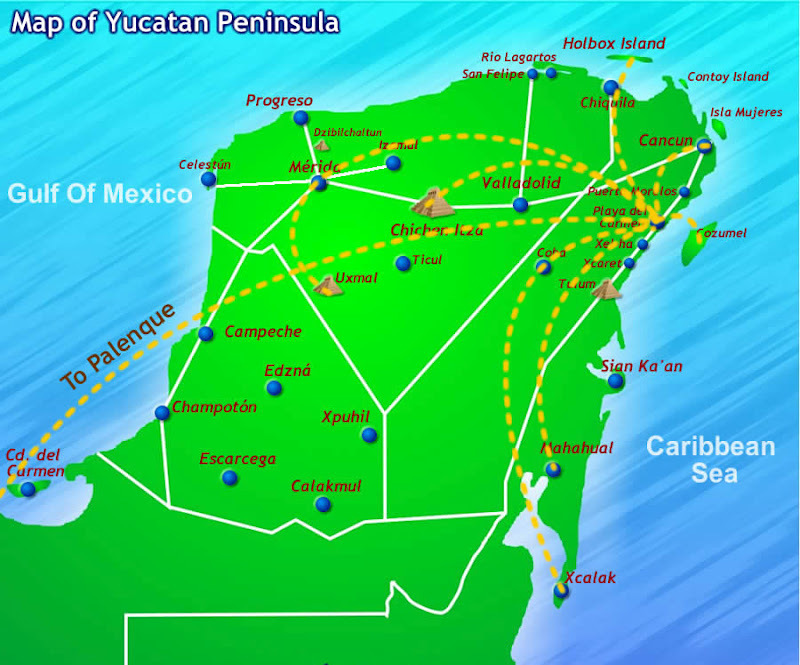 but this set-up on the Yucatan seems almost unfair. The Cancun, Mexico area hit some sort of vacation jackpot. Not only do they have insane beaches and weather but within an hour’s travel some of the worlds best ancient ruins (Uxmal and Chichen Itza for example), gorgeous fresh water cenotes and then this? 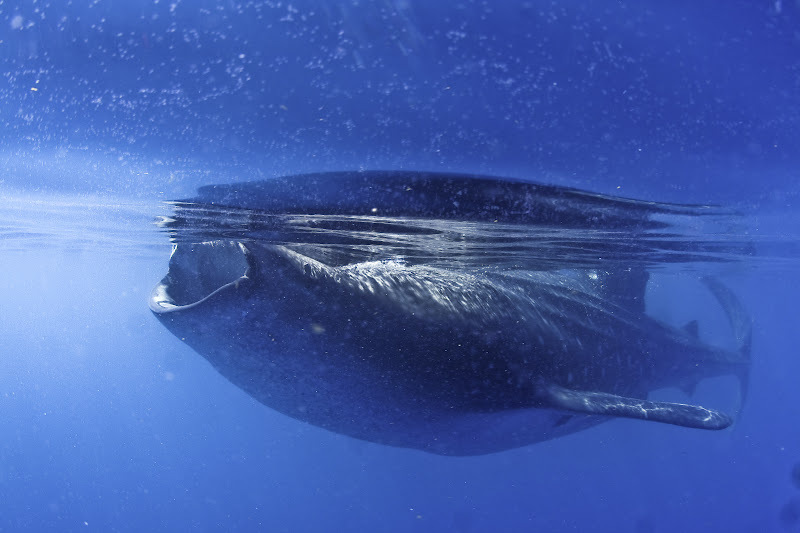 Swimming with the ocean’s biggest fish? It’s almost ridiculous.And I feel seriously lucky that it’s a relatively easy trip from Belize. (And you could make a similar argument for Belize…the coral reef, beaches, Mayan ruins, world’s friendliest people, jungle AND wildlife? )But let’s talk about Cancun right now…because I just got back from swimming with WHALE SHARKS and I am on some sort of vacation high. Whale sharks are the largest fish in the ocean. They can grow up to 40 feet long and live upwards of 70 years. These guys are filter feeder like many whales and eats mainly algae and plankton by filtering it through their huge mouths. 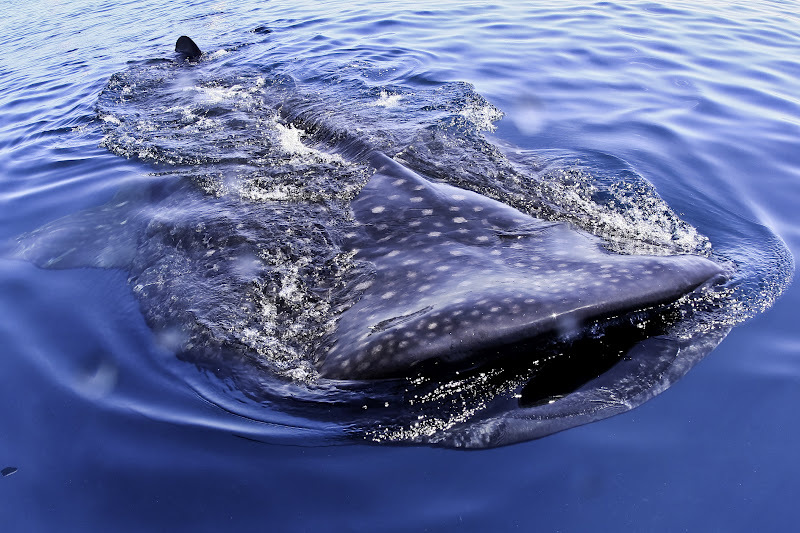 Every year between May and September (with the peak from mid July to Mid August), the area around Isla Contoy and Isla Holbox attracts hundreds of whale sharks. Some sort of upwelling of nutrients from the deeper cold water to the warm surface water bring in the sharks, huge manta rays,turtles and all kinds of fish. Reasons be damned. It’s freaking awesome! At the very beginning, I wasn’t positive this was going to be the best trip ever…so let me start at that point. A nice A/Ced van arrived at our hotel at 7:30am for pick-up. 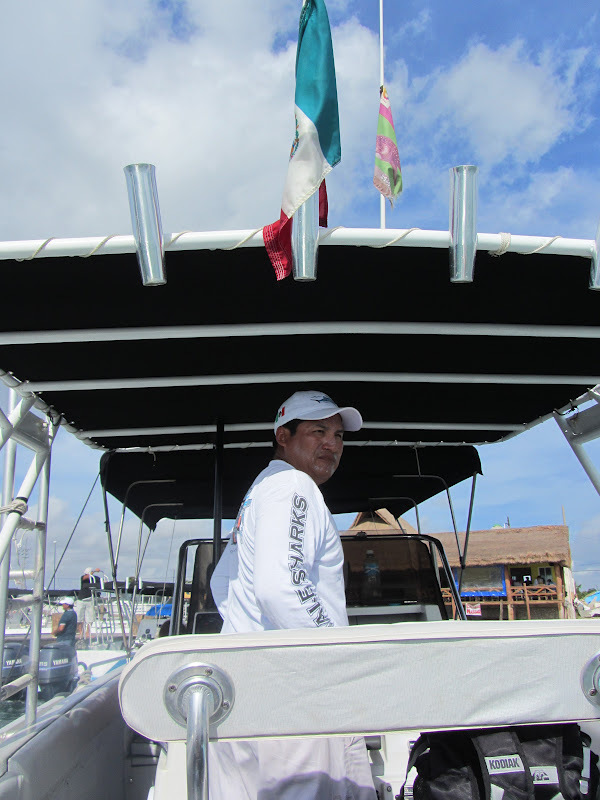 About 15 minutes later we were dropped off at a huge/palapa marina just north of Cancun (in an area called Punta Sam) that was PACKED with boats and people from all over the world. Surely this can’t be good if this huge crowd is going, right? We were one of the last two to load into a boat and meet our team. Up to 10 people are allowed on each boat. 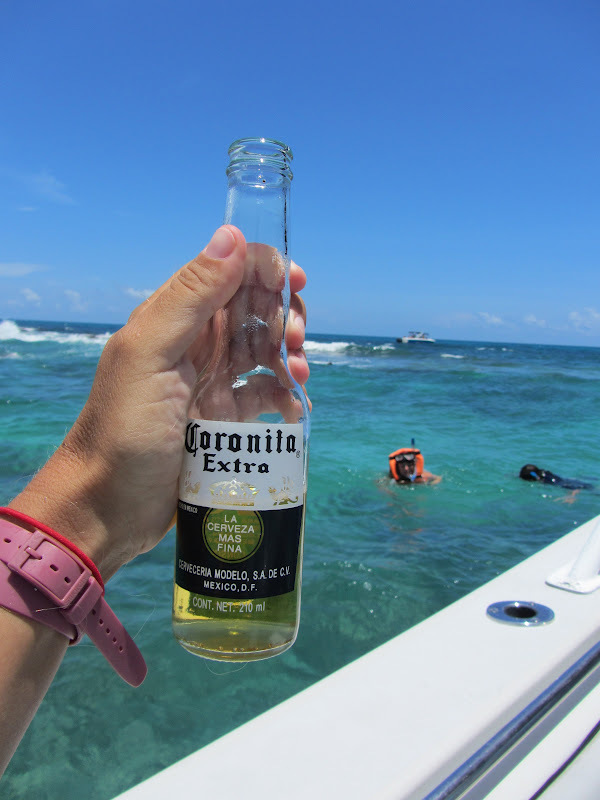 We had a family from Spain and two Russian couples…we sat at the back behind the captain for the trip over…first out past Isla Mujeres and then into more open water. And Flavio…who made the trip very fun. 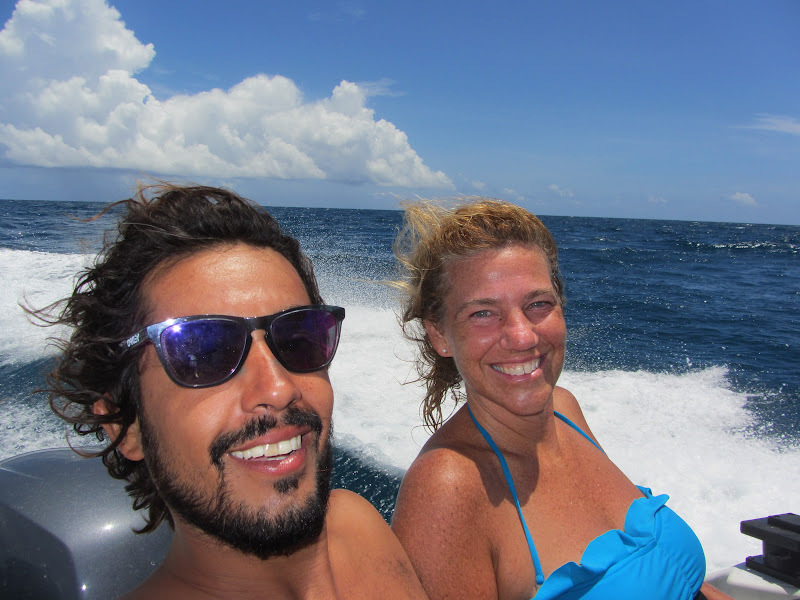 And for some reason, I thought that Belizean tour guides held the market on harmless tour guide flirting but Flavio was one of the best around. 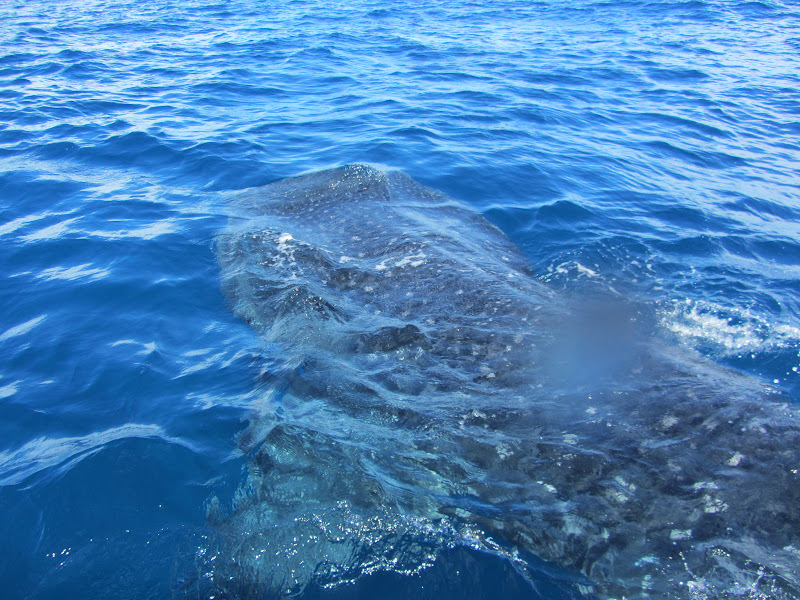 He also had my favorite characteristic in a guide…he was excited about each whale shark like it was his first time too. Giddy even. We were given his digits and told that we MUST party with him in Playa. And of course he is going to come visit in Belize. Nothing makes you feel more attractive than being in a chorizo wet suit that says XL Caballero on it. Right near the shark’s mouth? Sure. 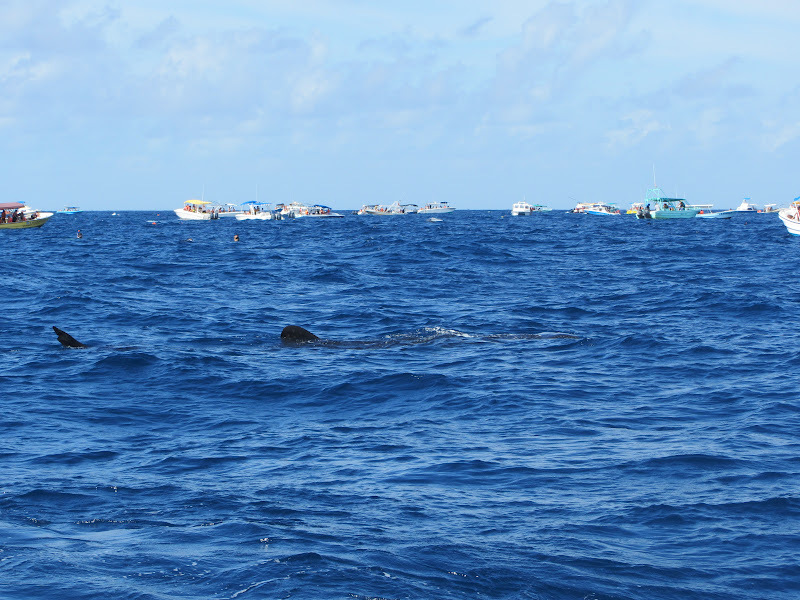 The shark could care less…it was like the 100 boats and all the snorkelers meant nothing. They were just cruising around skimming the water for the golden flecks of algae. At first you are just trying to stay out of their way…the tail and the gills gaping open are the only things really moving. That’s us swimming alongside our first shark. THAT’S US! Totally, totally insane. Perfectly smooth with three long ridges along their back, polka dotted, they don’t even seem real. It’s like you are watching a film through your swim mask even though the animal is less than 10 feet from you. It doesn’t matter that there are tons of boats and people out there. There were SO MANY SHARKS. I’d guess well over 60…maybe 100? At some times there were 4 or 5 just near our boat. You can swim with the sharks for about 10-15 minutes (or try frantically to follow them) and then the captain calls you out so that the next couple can jump in. You can go again later (up to 3x). PLUS you are exhausted. 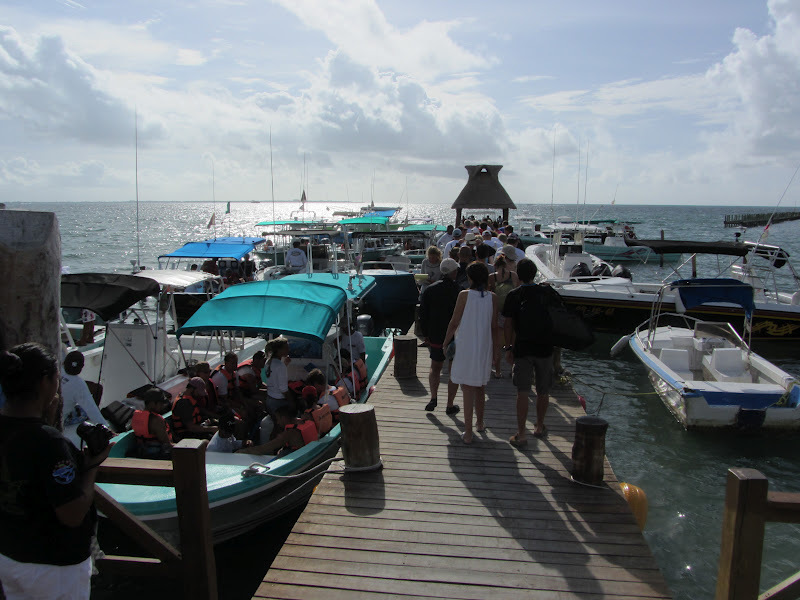 You spend about two hours in total at this stop and then it’s off to Isla Mujeres to “wind down”. We saw a few HUGE manta rays (10+ foot wing span?) feeding as well on our way out. 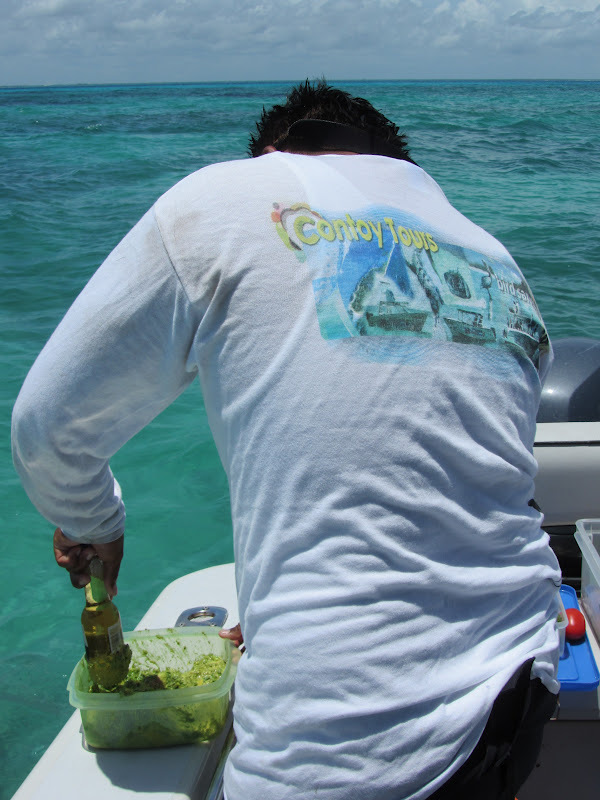 Our next stop is for a bit of snorkeling right off the island’s shore. A little bit of coral, some sea stars and fish…the kids seemed to like it. A perfect way to end the day and to come down from your total adrenaline high. 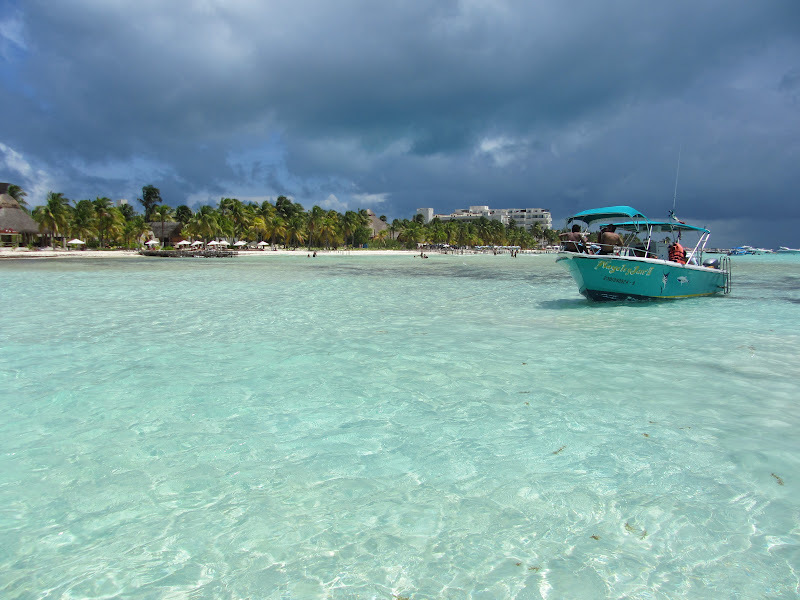 Some dark clouds started to roll in so it was a 10 minute boat ride back to the palapa dock by Cancun..
We were back at our hotel by 3:30pm. Seriously ready for a nap. 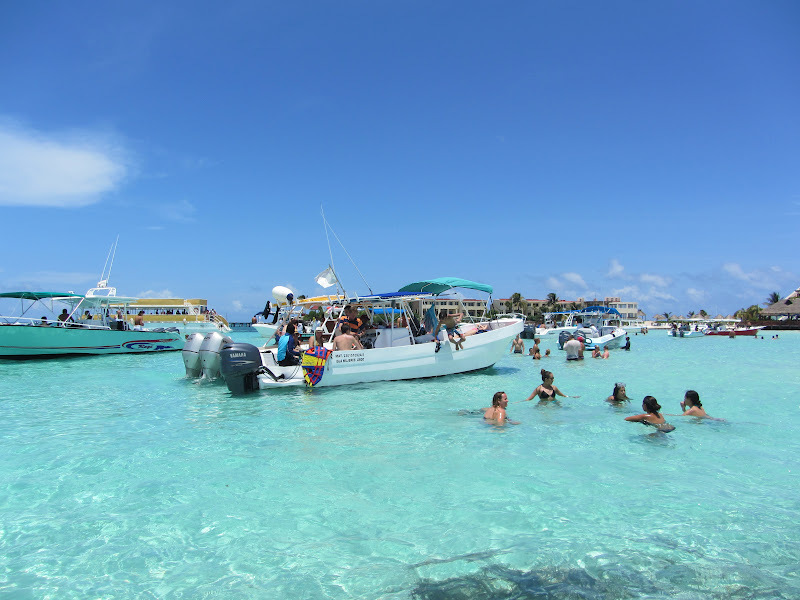 Our trip cost $150USD each and included snorkel gear and all transportation. 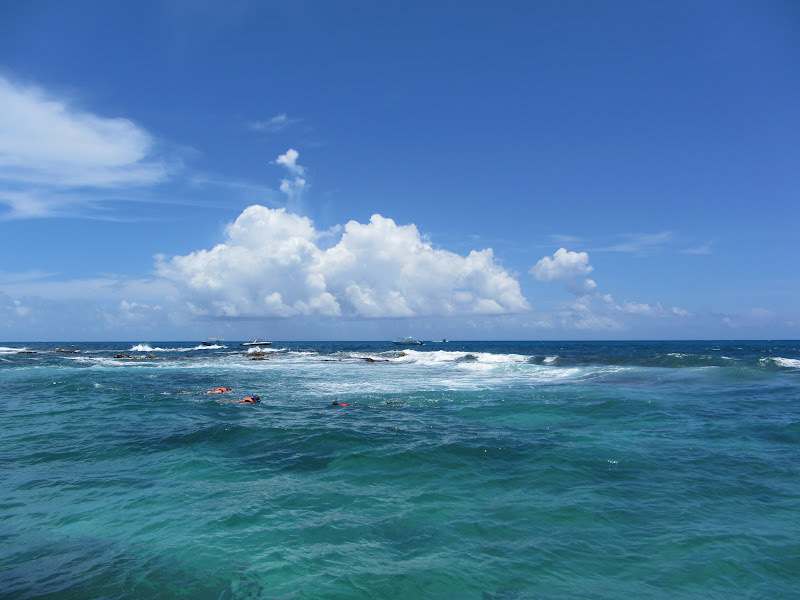 There were no divers that I could see…only snorkeling. To keep up with these things, diving equipment would just be too cumbersome. Plus, the sharks are at the surface, no reason to go deep. Know how to swim. Though this animal seem to glide slowly through the water, you spend lots of time chasing them and they move fast. Be comfortable snorkeling. This is not the place to learn. The water is fairly rough and when you jump off the boat? You are all in. Not a good time to be fiddling with your mask. Wear and bring lots of sunblock. There were a few Russians on our boat that I think might be in a hospital burn unit tonight. If you are an amateur, don’t buy or spend too much time fiddling with an underwater camera. Your guide takes pictures and sells you a disk at the end of the day. ($25USD) Look…here’s another great picture of Jamie. Rent or bring a wet suit: By law, you are required to wear either a wet suit or a life jacket when in the water with the whale sharks. You will want to swim when you are around them…they are on the move. The wet suit makes mobility 100% easier than a life jacket will. We paid $15USD a person to rent the suits at the dock. Go on this trip. It is absolutely exhilarating, amazing, unbelievable, humbling, almost emotional…I could go on… There is no way you will regret it. These tour groups will pick you up from areas as far south as Tulum, Playa del Carmen (both about $25-50USD more expensive)…you can go from Isla Holbox or Mujeres (tours are a bit cheaper from the islands). It is money very well spent. I still can’t believe what I saw. Like it? Pin it! Thanks. Great writing as always, fabulous photos, as always! Thanks for this. are the mandatory wetsuits/ lifevests to prevent anyone actually freediving down under the shark? or is it for safety? Love the pictures. I want to go swimming with the whale sharks more than ever now! I sure wish I had done it the last 2 times I was there. I won’t pass it by next time for sure! Did you see any scuba divers? Looks like it isn’t necessary to scuba to swim with the sharks based off the depth from your photos, but I’d imagine you get more interaction further down. What’s your scoop, Scoop? Mentioned it a bit above. There were no divers. Sharks totally on surface. Plus you need to move quickly w them. Don’t think diving would enhance…probably make it much harder. BTW….Diving with them is against the law. No one touching them…but sometimes it’s very hard not to get hit by them. Didn’t see anyone touching them…though I did get touched by a tail when trying to get out of the way. It moves in on you quick! lol…my hubby got hit too…we’ll have to share photos.. Thanks for the report. I’m thinking you should co-locate. I need a Riviera Maya Scoop. PS. Thanks for the postcard. Ha. No problem. I would love to work out a half/half situation…I love it here. Wow, completely amazing report! Your enthusiasm and excitement really came through — sounds and looks like one of those “peak” experiences that you’ll never forget. Awesome! my husband and I are going to go “scoop” out isla for possible relocation after visiting san pedro last june. thanks so much for the detailed post, I love your blog!! Dont they have shark diving near Placencia? They do but it is very deep water and from what I understand not as many sharks. But I have never been! Very exciting. Your thrill really comes out through your words. 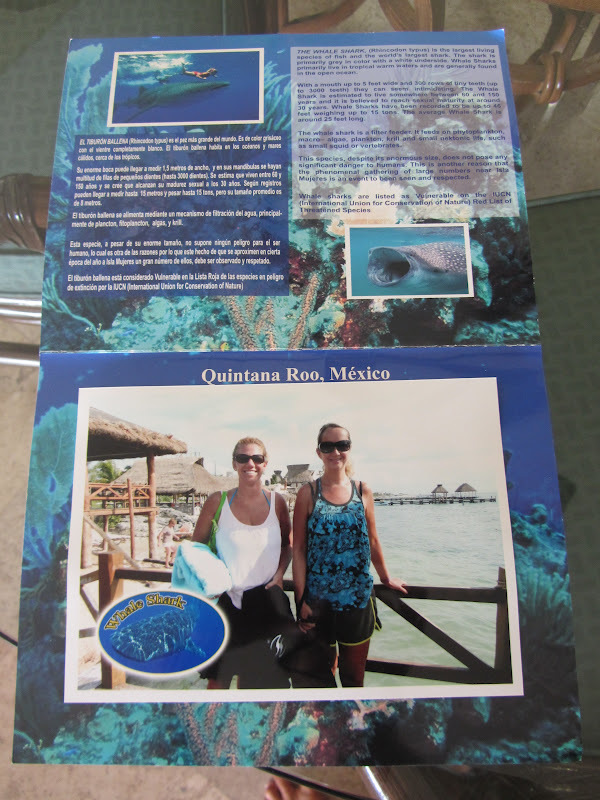 I have been diving (and snorkeling) with whale sharks many times in the pacific all around Mexico. La Paz, Socorro Islands; but I have never seen so many in one area at one time. They are amazing creatures. I am glad you briefly mentioned that the whale shark is the largest fish in the oceans. We need people to understand, they are not sharks or whales. They are fish. They seem to enjoy people, but like any other wild creature, I have never been allowed to touch them. I saw a picture where someone is petting the fish. Let us leave them a little weary of humans, it is safer for them in the long run. I will be moving to San Pedro in a few months and I will be very happy to dive with my old friends again, very soon. The giant Mantas are very amazing as well. I have been diving with the Mantas and they also like people. It is said, they enjoy our bubbles tickling their tummies. We had one that just stayed right above us for about 40 minutes while diving in The Socorro’s. Great pictures! Absolutely amazing. Thanks! And yes…no touching!